Protocol and research about steroid therapy. A Canadian drug manufacturer releases a new version of Bendectin. Updated information on the Zofran allegations. Individual responses to medications vary greatly. Target the triggers of nausea/vomiting such as motion sensitivity, while ensuring adequate hydration and metabolic balance. If a woman is vomiting constantly, oral dosing of medications will likely be ineffective. Read our brochure on medication strategies! Learn how to get the most from medications & use them to manage HG most effectively! prevent side-effects like constipation exacerbated by dehydration. Mother's Note: If you have pre-existing medical conditions (diabetes, heart disease, etc. ), a history of medication reactions, or are a smoker, please inform your physician before taking medications. Highly selective antagonist of 5-HT3 receptors in the vagus, CTZ (chemotrigger zone) and gut. Mostly Class B drugs. Found to improve symptoms in >80% of women. * Proactive, daily bowel management is very important. For information on managing these symptoms, see this article on MedicineNet. Often effective in mothers who have multiple triggers (smell, motion, etc. ), a history of hormone sensitivity, and/or moderate to severe vomiting. If a woman has a history of HG that responded to serotonin antagonists, it should be considered as a first line drug to minimize symptom severity. IMPORTANT: Effects are dose dependent. Best taken on a strict schedule and weaned very slowly when asymptomatic for two weeks. May be needed until delivery. Given via SQ pump, oral tablet, liquid, quick dissolve film, or IV. Suppository available outside US. Zofran tablets are available as a generic. Antiemetic medications in pregnancy: a prospective investigation of obstetric and neurobehavioral outcomes. More research articles on PubMed. Also available in transdermal patch form as Sancuso. Kytril is available as a generic. Mirtazapine (Remergil, Remeron) May interact with sedatives, antihistamines, and tricyclic antidepressants. Has both anti-vomiting and anti-depressant effects. Mirtazapine (Remergil) for treatment resistant hyperemesis gravidarum: rescue of a twin pregnancy. Mirtazapine use in resistant hyperemesis gravidarum: report of three cases and review of the literature. (palonosetron) Dose not established in HG. 0.25 mg IV given for chemo. Half-life: 40 hr. & only given once in 5 days. Reimbursement Support Network. None for HG yet. Research on PubMed. (Dolasetron) Dose not established in HG. 50-150 mg orally daily is reported. Research articles on PubMed. This is a NEWER class of drugs so minimal safety data is available. No studies for its use in pregnancy are available. We caution the use of this medication class and suggest use as last resort. View research articles about Emend use in pregnancy.. Typical protocol (prevention of vomiting due to chemotherapy) includes combining with a serotonin antagonists and steroids. None for HG yet. - Diabetic mothers may require as much as a 40% increase in their insulin when high dose steroids are started. Medrol or Solu-Medrol (Methylprednisolone or Prednisone) Typical oral dosage is 48 mg per day for three to five days, followed by slow tapering over two to three weeks. Limit to one month of therapy if possible. See article for more on dosing. Consideration use with serotonin antagonists and/or during weaning from steroids to prevent relapse. Common side-effects: Drowsiness, dry mouth, blurred vision, constipation, urinary retention, restlessness, insomnia, sedation, upset stomach, nervousness, headache. Effective for MILD cases of nausea and vomiting during pregnancy or as adjunctive therapy. Antihistamines with sedative effects can be helpful for sleep. HER Foundation Colloborative Research: Antihistamines and other prognostic factors for adverse outcome in hyperemesis gravidarum. A review of antihistamines used during pregnancy. J Pharmacol Pharmacother. 2012 Apr;3(2):105-8. View more research about hyperemesis gravidarum and antihistamines. (Dimenhydrinate) 50-100 mg every 4-6 hours Used for motion sickness. Often taken with vitamin B6. Average dose is 1 tablet in morning, one in afternoon and two at night. May be given in higher doses up to 12 tablets daily - see research links on right. Differs from Unisom/B6 combo because it is a delayed release formula. The return to the USA of doxylamine-pyridoxine delayed release combination (Diclegis®) for morning sickness. Common side-effects: Drowsiness, hypotension, dry mouth, constipation, urinary retention, rash, extrapyramidal symptoms (EPS)*, restlessness, confusion, fatigue. Phenothiazines lower seizure threshold. *Call your doctor immediately for involuntary movements, tremors and rigidity, body restlessness, muscle contractions and changes in breathing and heart rate. May be helpful in mild and moderate cases or used in conjunction with other medications. Co-administer antihistamines to minimize side-effects. 25 mg every 6–8 hours rectal Risk of EPS increased with metoclopramide (Reglan). Treat/prophylax for EPS with Benadryl. Research articles on PubMed. Warning: IV or injected doses can cause tissue damage. More info available on fda.gov. GIVE IV dose SLOWLY to avoid contractions. Side-effects of anxiety, sedation, and restlessness common and may limit use. Research articles on PubMed. - Common side-effects: Headache, dizziness, difficulty sleeping, constipation, diarrhea. - Helpful both for reflux and for prevention of gastric irritation which worsens nausea. - Use when a woman is vomiting frequently and/or cannot eat and drink sufficiently. - Studies suggest they are safe during pregnancy. Mostly Class B drugs. Omeprazole (Prilosec, Zegerid) are class C.
(Ranitidine) 50 mg IV every 8 hours or 150 mg orally daily or twice a day Reprod Toxicol. 2005 Pregnancy outcome after exposure to ranitidine and other H2-blockers. (Cimetidine) Not recommended during pregnancy due to anti-androgenic effects in humans. (Famotidine) 20 mg IVP/orally every 12 hours Reprod Toxicol. 2005 Pregnancy outcome after exposure to ranitidine and other H2-blockers. Proton Pump Inhibitors: An Update. Use of proton pump inhibitors during pregnancy and rates of major malformations: a meta-analysis. Reglan blocks dopamine receptors in the CTZ (chemoreceptor trigger zone) and increases the CTZ threshold & decreases the sensitivity of visceral nerves that transmit afferent impulses from the GI tract to the vomiting center. - Helpful in women who vomit after eating/drinking, and who do not respond to Zofran alone. - Sometimes used in conjunction with meds such as Zofran. - Use with antihistamines to minimize side-effects. - Side-effects are very common and can be severe, especially when given quickly through an IV. May be given orally, SQ pump, IV (SLOWLY) FDA recommends this drug be taken for up to 12 weeks. Risks of serious side-effects increase thereafter. Increased CNS side effects when used with phenothiazines. Side-effects common and may limit use. Use with antihistamines. Ondansetrone or metoclopromide? Which is more effective in severe nausea and vomiting of pregnancy? Ondansetron compared with metoclopramide for hyperemesis gravidarum: a randomized controlled trial. (Cisapride) 10 mg orally every 6 hours, before meals and at bedtime (maximum dose 20 mg every 6 hours) No CNS side effects. Limited availability in US. Common side-effects: Confusion; dizziness, lightheadedness (continuing) or fainting; eye pain; skin rash or hives. Should not be used in treatment of hyperemesis gravidarum. These agents slow gastric emptying and prolong GI transit time. Clonidine New medication being used for HG. Catapres-TTS (Clonidine) New medication being used for HG. Transdermal clonidine in the treatment of severe hyperemesis. A pilot randomised control trial: CLONEMESI. Gabapentin (Neurontin) In trials for use in HG. Considered as last resort in patients who have exhausted other medication categories. Potential maternal symptomatic benefit of gabapentin and review of its safety in pregnancy. A case of treatment refractory hyperemesis gravidarum in a patient with comorbid anxiety, treated successfully with adjunctive gabapentin: a review and the potential role of neurogastroentereology in understanding its pathogenesis and treatment. 5 mg/day minimum; Considered non-toxic. For HG: 100-500 mg BID IV. IM contraindicated. Should be given orally before and during pregnancy as tolerated. Body's stores depleted in < 3 weeks. 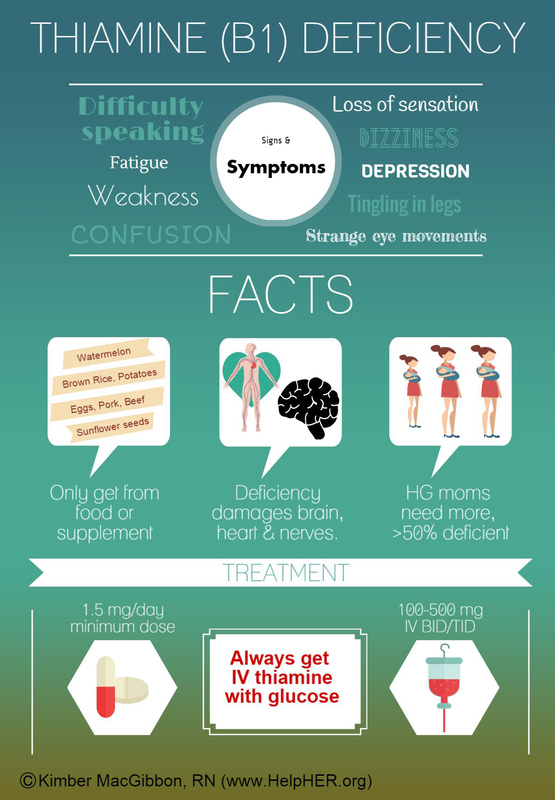 Infographic on thiamin deficiency in HG. Iatrogenic wernicke encephalopathy in a patient with severe hyperemesis gravidarum. Doses up to 150 mg are being used. Paresthesias may occur if B6 is taken in high doses. Note: reactions to vitamins are rare but possible. Serious adverse drug reaction in a woman with hyperemesis gravidarum after first exposure to vitamin B complex containing vitamins B1, B6 and B12. A prescription is NOT required for this medication. Ginger 250 mg orally every 6 hours Helpful as adjunctive therapy. (Fructose, Dextrose, and Phosphoric Acid) One or two tablespoonfuls upon arising and every three hours as needed. Helpful as adjunctive therapy. (Dronabinol) Dose not established for HG. Effects of prenatal exposure to marijuana. Does cannabis/THC do harm to the fetus if it is used during pregnancy? (Diazepam) Dose not established for HG. Class D drug. Evaluation of treatment of hyperemesis gravidarum using parenteral fluid with or without diazepam. Briggs (LBMMC) Hyperemesis Protocol Use with diphenhydramine to avoid side-effects. Category C drug. Droperidol and diphenhydramine in the management of hyperemesis gravidarum. Excerpted from Drug Information for the Health Care Professional, USP-DI, Volume 1A, 11th ed., 1991.